John, the fur color and detail is sublime, love the attentive head turn pose with those giant, perked up ears. 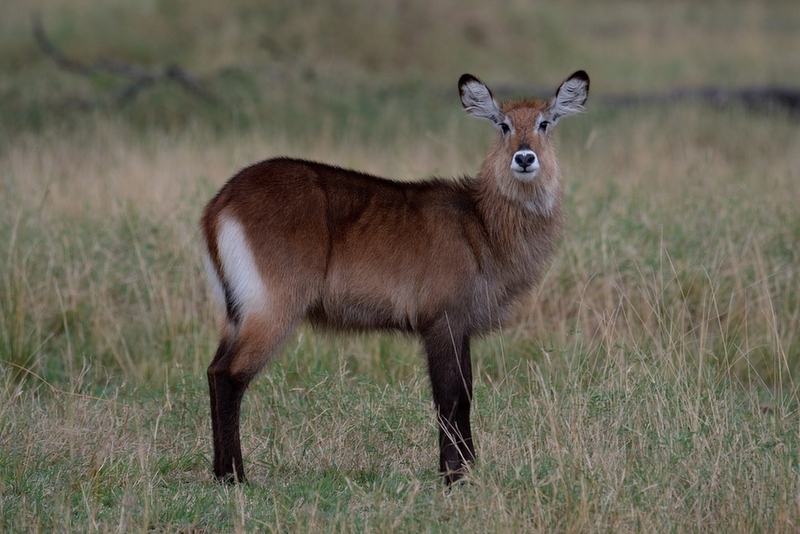 Great to see the hint of habitat, though Ms. Waterbuck steals the show - beautiful work! Ms Waterbuck posed so prettily for you, John. A very nice portrait of this long haired beauty. I love Waterbuck because they're so different from the more usually seen Impala and Gazelle with their sleek coats. Very pretty expression you caught with this beauty- so alert looking. A click improves this greatly to see the lovely details of the coat and colors. I noticed she/he has a heart for a nose! . I noticed she/he has a heart for a nose! . Yes, you're right! I hadn't noticed that. Nice catch! What a beauty she is with that handsome fur coat. Nice pose and composition. Beautiful specimen John. Looks like a good trip!. You nailed the details and techs are spot on. I have a tendency to move my subject in this scenario towards a decentered position, but I understand this balanced composition as well. Nicely done John.